@ colleen what is the name of the U2 song? 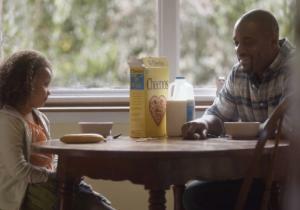 NY Daily NewsCheerios is bringing back an interracial family to star in its Super Bowl ad. I love the Cheerios Commercial also. Did I just see Alf and Chucky in the same commercial? Has the 80s become the new 50s reference? some local radio personalities will be on a renters warehouse commercial between the 3rd and 4th quarter. Quick myTalk update, I have checked in with Margery, Tam, and Amy. Tam and Amy are going strong on the Master Cleanse. Jury is out on Margery. She's being shifty. How has that store stayed in business? happy for percy harvin, suffer so much, this is only his 3 or 4th game again this year. That's my friend Ted driving that truck!!!! !